Every time I see the title of this book, I can't help but think of Build-a-Bear. Let me assure you, no bears were built or harmed in the making of this post. This is a cookbook (sent to me at no cost) about assembling meals in bowls. They're just so trendy these days, right? Basically, you start with a grain and then top with stuff that works together. And you get bonus points if the stuff is colorful so you can post it to social media. When I make things like this, it's usually that I have leftover rice and random stuff that sounds good in the moment. I don't actually plan bowls. Seriously, though, arranging food in a bowl can be a cool way of serving things that would look a whole lot more boring if you plunked them on a dinner plate or served them family style. 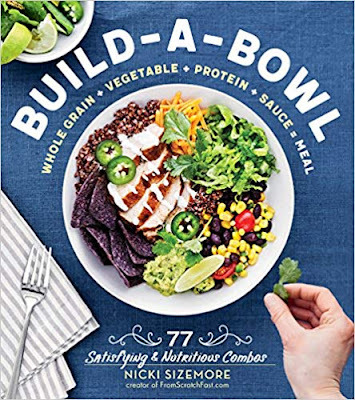 Thus, a book called Build-a-Bowl by Nicki Sizemore exists. So you can learn about the bowl formula and about get some great ideas for meals you might not have thought of before. The recipes all include the suggested grains for each recipe, but let's face it - if you like white rice and hate quinoa, it's perfectly fine to use whatever you like in these recipes. The grains aren't the star of the show, anyway. The stuff on top is where you'll find most of the color and flavor. The one recipe that caught my eye was the Huevos Rancheros. They suggest millet as the grain, but I'd probably use rice, simply because I always have rice on hand. Which also means I'm likely to have leftover rice from another meal so this could be a super-easy recipe when I don't want to cook anything super complicated. The ingredients includes the grain, beans, salsa, cheese, avocado, and a some garnishes. Those are all things I usually have on hand, so this is the kind of meal I could make pretty much any time. Well, okay, there's a recipe for salsa included, but you could use your own, if you had it on hand. The Greek Goodness salad also sounded amusing. It's got a lot of the same ingredients that I use for Greek salads, but this time it was all on top of some cooked grains in a bowl. I can see how that would make the salad more filling and dinner-like for people who wouldn't want a salad all by itself as a meal. Chicken Burrito Bowls had a lot of the ingredients you might find in or on a burrito, including lettuce and tortilla chips. But again, served over a grain. If you like the idea of food in bowls and need ideas, there are 77 recipes, plus a lot of information about grains and the bowl "formula." This book was sent to me at no cost. Because, yeah, I get a lot of cookbooks to review.